Download a flyer for 2018-19. (PDF format). Act!vated Story Theatre promotes reading, folktales, performing arts, and families learning and having fun together! Presented by the homeschooling ...err... make that the "roadschooling" Goza family. We'll bring the show to your group. 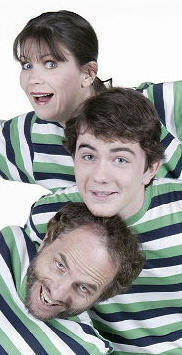 Act!vated Shows are ideal for mixed age groups. 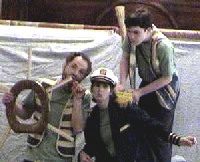 The physicallity in the performance appeals to infants and toddlers, while kids enjoy getting involved in the stories and the adults appreciate the witty scripts that include humor just for them. All ages are wowed by the tennis racket trick and the chance to learn American Sign Language. All you need to host a show is an indoor location with a performance area of at least 12' x 12' and room for up to 250 parents and homeschoolers. Send us an email and find out when the act!vators will be touring your area. 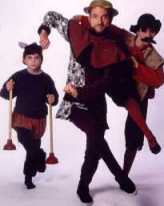 The program includes a pre-show drama workshop for up to 12 kids (age 6 and up). The guest stars rehearse with the performers for a half hour, learning acting skills and parts in the show. And now he's out on his own and can be found performing Shakespeare in the park - video recorded in August 2012. The Goza Family were feature presenters at the California Homeschool Conference in August 2007 and 2013. Bring your family or your homeschool group to the public shows sponsored by local libraries and other community organizations. Check the tour itinerary for show locations, dates and times. Be sure to contact your local librarian if you plan on bringing more than 10 people. 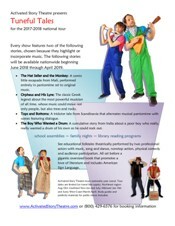 There is a performance opportunity for up to 12 kids (age 6 and up) who arrive one half-hour before show time. Be sure to RSVP on Facebook. Study Guides for pre-show and post show activities to maximize the learning experience. Please note that programs held at schools are not open to the public but, you may be able to make arrangements with the school. Doesn't hurt to ask! We'll do what we can to help you. Share the information about free public shows with your friends and homeschool groups in your area. Tweet! Facebook. Blog. It all helps. The more audience members that come to the show the happier we all are. We promise your friends will thank you. All we need is an indoor space with a performance area of approximately 12' x 12' (such as a meeting room at a church, library, campground or community center) and a group of enthusiastic people. Hands-on Minds-on Workshops can be arranged after the show for groups of up to 30 participants each. Hand Play (American Sign Language) is highly recommended for all age levels. 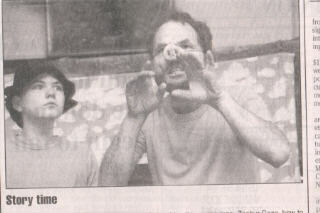 Performance Art Skills is also a fun one for older kids and teens. There are also writing workshops and more to choose from. Individual workshops may also be scheduled for homeschooled groups that wish to piggy back with shows scheduled in your area.